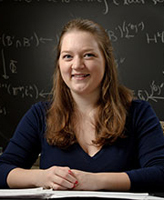 MurphyKate Montee, a senior honors mathematics and music double major at the University of Notre Dame, has received the 2013 Alice T. Schafer Mathematics Prize, an honor awarded to only one undergraduate woman in the U.S. each year. Montee has already authored or co-authored three research articles, two of which have been submitted for publication and have appeared on the Mathematics ArXiv. Montee’s adviser is Frank Connolly, professor of mathematics and director of the SUMR program. The Schafer Prize for Excellence in Mathematics was established in 1990 by the Association for Women in Mathematics (AWM). The prize is named for the AWM former president and one of its founding members, Alice T. Schafer, who contributed a great deal to women in mathematics throughout her career. Many of the previous winners are now notable mathematicians. Montee is Notre Dame’s first winner of the Schafer prize, but five previous members of SUMR have been runners-up or have received honorable mentions in the competition. In addition to excelling in mathematics, Montee also has a passion for music and is pursuing a concentration in vocal performance as part of her second major in music. She sang the lead mezzo-soprano role in Sondheim’s Sweeney Todd at Notre Dame this year and will be the lead soprano in the University’s 2013 production of Poulenc’s Dialogues des Carmelites. Montee accepted the 2013 Schafer Prize at the Joint Mathematics Meetings, held January 9-12 in San Diego. She is the daughter of Tim and Gretchen Montee of Sturgeon Bay, Wis.